I'm currently writing a prototype for MO6 and i'm facing two little issues. 1) At the beginning of my code, i paint black page 2 and page 3 to erase the screen, and that works when assembling and executing from the environment. But if i assemble the BIN and try to launch it from Basic (LOADM"FILE",,R) the artifacts on page 3 are still on the screen. You can then overlay by moving the sprites so i think there's something wrong in the initialization here...? 2) I would try to draw sprites on the fly by code, but this leads to write very big files and i'm forced to assemble the BIN on disk and test my work by executing from Basic. Of course, when i back to macro assembler env, the resident code is lost and i have to reload the ASM. That's a little uncomfortable. Can i do it in any other way? I'm still a beginner and this is the first time i have to handle such a "big" project. It would have been better if you show us the full code. Difficult to say what is wrong otherwise. If you want to work with the original computer, there is no other way. It's uncomfortable but... it's like that. 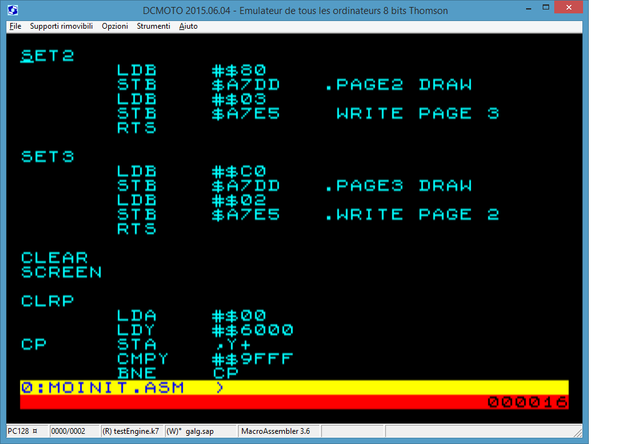 Try with an MC6809 assembler on PC and an emulator instead. Well, it's fixed now, it seemed a initial config issue as i said. I am already working on DCMOTO and i assemble with your 3.6, but i have also the C809 assembler for win and unix, so if i build from there how can i test my BIN into the emulator? -$(C6809) -bd -am -oOP "$<" "$@"
Then in DCMOTO, using the debug tool, you can load that RAW file into a specific memory location. Can i transfer the bin in .sap file (virtually, not for real) and load it as normal virtual floppy on DCMOTO? I saw there are some tools like SAPTOOL but i don't know if they works for this case specifically. Yes you can transfer the BIN file into a SAP file and then load that SAP file in any emulator. It works like a charm. What do you use to transfer the bin into SAP ?